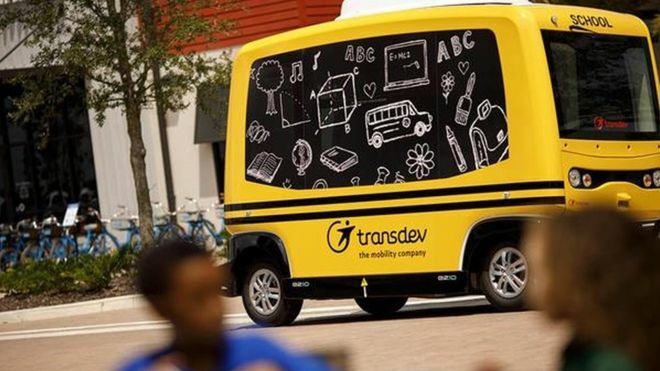 French-based transport firm Transdev has been ordered to stop an "unlawful" test of a driverless school bus in Florida by US regulators. The regulator said the firm had not been authorised to transport schoolchildren in Florida, and said the test was "irresponsible" and "inappropriate". Transdev said it would stop the test a week early. The firm said it believed the pilot met testing requirements. But the National Highway Traffic Safety Administration (NHTSA) said the test of the EZ10 Generation II driverless shuttle in the Babcock Ranch community in Florida was outside the scope of what the firm had been authorised to do. "Innovation must not come at the risk of public safety," Heidi King, NHTSA deputy administrator said in a statement on Monday. "Using a non-compliant test vehicle to transport children is irresponsible, inappropriate, and in direct violation of the terms of Transdev's approved test project," she added. The NHTSA said it had given Transdev permission in March to import the driverless shuttle on a temporary basis for testing and demonstration purposes, but not as a school bus. The regulator said it had sent a letter to the firm ordering it to "immediately stop transporting schoolchildren" or risk fines, "the voiding of the temporary importation authorisation, and/or the exportation of the vehicle". Transdev said it had voluntarily agreed to stop the test and that the "small pilot was operating safely, without any issues, in a highly controlled environment". The company said it believed the pilot met the requirements of the testing and demonstration project approved by NHTSA for adults and children to ride on the same route. It added that it did not sacrifice safety for progress, would never do so, and was committed to complying with regulations. In August the firm said the fully electric shuttle for 12 people, which would operate with a safety attendant, had a top speed of 8mph, with a potential of reaching 30mph. Transdev North America is a unit of Transdev, which is controlled by French state-owned investment fund Caisse des Depots et Consignations. There are a number of low-speed, self-driving shuttles being tested in cities around the world with others planned. In November 2017, a self-driving shuttle bus in Las Vegas was involved in a crash on its first day of service, which police said was the fault of the human driver of a lorry. In the UK, driverless buses are being developed in Cambridge.